There is a growing trend in room escape games as of late: be minimal, focus on puzzles not decor. The Puritan approach, perhaps? Delving into the essence of a good escape might reveal much more than a few cleverly construed puzzles, but no escape could exist without them. So if we're going to be poking around in starkly furnished, nearly naked rooms, then it's always a welcome sight to see Tesshi-e at the party. As it turns out, an Escape from the Room with No Furniture can be just as full of Mild Escape goodness as any, more dressed-up offering. Some things never change—because "he" is rearranging his room and has taken out all the furniture, it happened to be the perfect opportunity to revamp it for a new escape. And, of course, you can't resist the challenge. Your first look around the plain walls and floors, though, might not turn up much help. Just a locked door... Hmmm. Do a little more prodding about and soon you'll notice slight visual clues to send you forward with puzzles popping out all over; you'll be unlocking the code to one hidden niche while garnering clues for opening the next. In the usual Tesshi-e fashion, you don't get the added help of a changing cursor yet attention to details and the narrative hints should be all you need to make your way through the exit, even stumbling upon a "Happy Coin" along the way. If Escape from the Room with No furniture proves anything new, it's not so much that looks can be deceiving; that's already been well established. Instead, although the characteristic Tesshi-e charisma still comes across in every way, from the opening sequence to the congratulatory light meal in the end, a significant part of Tesshi-e's charm comes from the kitschy furnishings and quirky interior decor. When they're gone, the result is a little less fun. The dull scenery just seems a bit... sad. There are a few other minor changes that are not really improvements as much as they're just different. Different is okay sometimes, yet you know how it is when your friend gets a new hair style and it just doesn't quite look like her? It takes some getting used to. But getting away from the trivial complaints, there is one puzzle/task in particular that was not handled as well as you'd expect from this designer so I'll leave you with this: if you think you know the solution to something, but it doesn't quite work, try it from a different perspective. Or maybe it's just me? Regardless of any nitpicking, Escape from the Room with No Furniture continues the trend of whimsically amusing romps we've come to count on from Tesshi-e, even without the fancy get ups. 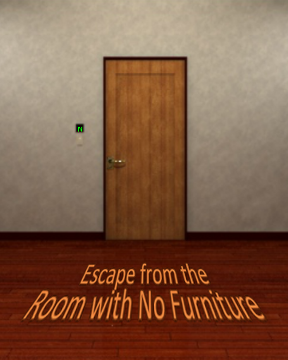 Escape from the Room with No Furniture Walkthrough now available! You begin facing the door. Good. Maybe we can leave right off? The HEART KEY! Woo hoo! Take it. Click. Click. Click. Click. Broke. the TOP PART OF THE HEART-SHAPED KEY. There is a digital panel above the switch. Clicking on it will reveal a series of letters. Trying to spell anything comes to nothing, though. You can turn off the lights and look around but, at this moment, that reveals nothing as well. Back away from the door and turn left. Now you're facing a blank wall with two panels: a larger one on the right and a smaller one on the left. The panel on the left appears to be key operated, so keep an eye out for one of those, too. Examing the Mr. Birdy picture, it is (of course) quite wobbly when you click on its corners. Looking closer at the floor panel, there appears to be no way at all to open it. Clicking the numbers on the front of the safe makes corresponding lights lit up in a circle. 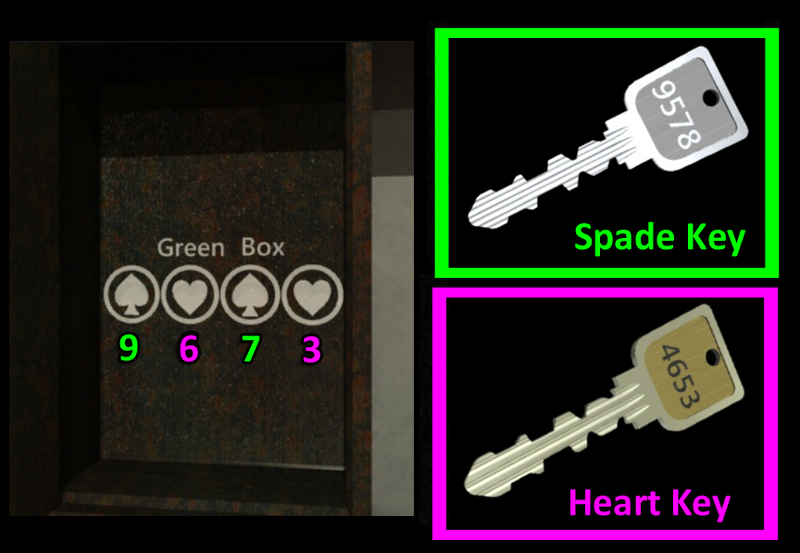 The number from the heart key, unfortunately, won't unlock the safe. Examining the tiny wall plate to the left of the safe, you'll notice a thin gap along its top edge. Use the BROKEN HEART KEY to wedge it open. Back up once to look inside the niche and you'll see a button: push it. That makes the floor panel by Mr. Birdy's picture open and a balloon fly out. Back up once then click twice on the fallen A COVER to pick it up. Insert the CLOVER KEY and then click it to turn it. Examine the screwdriver and get a TOOTHPICK from inside its handle. Also take the MEMO from under the green box. Read both sides of the memo for two more clues. Now that you have a screwdriver from the green box behind the smaller panel, go back to the larger panel on the right. and a HIPPO. Take the HIPPO. A closer look at the HIPPO shows something written on its back that looks like compass directions. Notice how the four holes inside the floor box look like a good place for the HIPPO's feet? Put the HIPPO in there. That causes a hidden drawer to pop open: get the GLASS CONTAINER. Also make a note of the N E S W markings on the Hippo's back. Back away from the floor panel. Zoom in on the Mr. Birdy picture. "Mr. Birdy will fly at the tenth time." Translation: wobble the picture ten times (or less). Just keep clicking one of the corners until the picture slides up. Get the LIQUID B bottle. Also notice that there is another digital letter panel here. Turn to the door and flick off the light switch and have a new look around. In the dark, there are new markings on the clock. Now go back and turn on the lights again. 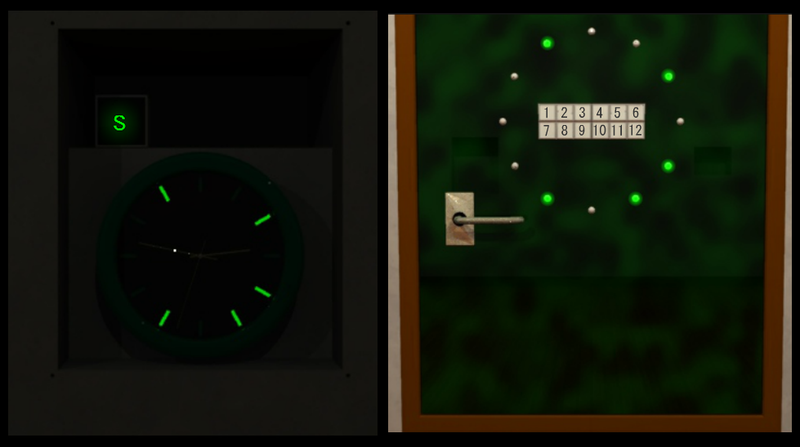 Click only the numbers that correspond to the markings on the clock when the lights are out. With the correct buttons lit up, click on the safe handle and it will open. Notice there is a fourth digital letter panel here and a locked wooden box. By now you have found all four digital letter panels, one on each wall. It's time to unlock their secret. Open up the box and get A STRAW. Examine the STRAW you found in the wooden box. Insert the TOOTHPICK into the straw. Click the blue balloon to get a good angle under it. Then, with the STRAW/TOOTHPICK combo in hand, click the blue balloon again to pop it. Just above the open floor nook is a new item: a SPADE KEY! Pick it up. Use the SPADE KEY to unlock the metal star safe. Make a note of the symbols on the wall inside the metal safe. Use the PLIERS to remove the TIP OF THE BROKEN KEY. Take the corks out of each bottle, LIQUID A and LIQUID B.
Pour the opened LIQUID A bottle then the opened LIQUID B bottles into the glass container. Now that you have superglue, dip the TOP PART OF THE HEART KEY into the bowl of glue. 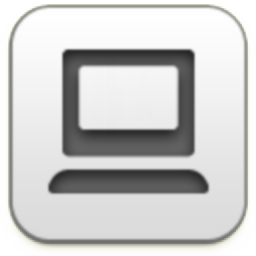 The TOP PART OF THE KEY will now be in your main view. Open "FUNCTION" and select "SAVE" and then "YES." Now you can reload to begin again at this point. To exit normally, insert the HEART KEY into the door lock and click the handle. Enjoy your reward! To get the "happy" ending, don't use the repaired HEART KEY on the door until you've obtained the HAPPY COIN. Look at the clue inside the metal star safe (under Mr. Birdy's picture). It tells you "Green Box" and has some symbols. The SPADE SHAPED KEY has new numbers on the back. The HEART SHAPED KEY also has numbers. Hmmm. You want the first and third digits of the spade key then the second and fourth digits of the heart key. The HAPPY COIN. Take it! Turn back to the door. Use the HEART KEY, click the handle, and enjoy your new ending! Pretty straight forward effort for Mr. Tesshi-e. Puzzles are all pretty logical and straight forward. Thank you! moving picture puzzle. I cliked it a couple of times to make sure it was what I thought it was then I literally thought to myself, "I wonder if anyone has ever managed to get one of these just by random clicking". Turns out if I'd tried I could have done it! And probably died of shock shortly afterwards. Had trouble with the NEWS orientation due to the way it turned the clue without me noticing whenever I zoomed in. But other than that it was fairly straightforward. I'm curious what the "different perspective" puzzle was referenced in the review. Maybe the hippo? Or the clock? The hippo was well-clued but I could see people having trouble with the clock. However, all the visible hands were kind of between numbers, so it wasn't too surprising that the visible time wouldn't work. I wanted to pour the glue on the broken part of the key, not dip the key into the glue. Then, I wanted to glue the broken top to the tip once it was still in the door. I mean, why not, right? Could work. No? Ah well. To me, it seemed that could be handled better but it wasn't a matter being stumped at all. It wasn't even a hard puzzle so it felt like arbitrary tasking rather than fun creating (for example, I loved making a pon pon ship in the last escape). Oh god, nothing's scarier than a room with no furniture!! Whatever... this was an easy one, explains why I was out so swiftly ! Paris weather report : grey and cold, bring your polar suit ! (in Seinfeld voice) So, who *is* this guy? And *why* do we keep falling for this? "Want to go out to eat"
"Sure, I'm starv...hey, I'm locked in a room!" "Sure, let's go see the new Red Daw...oh no, I'm locked in a room!" "Want to get locked in a room?" "Sure, I'd love to get loc...hey, I'm locked in a room!" Been trying for days to play this game but it will not load. Anyone have a different link to try? I searched Tesshi-e's site for one but there doesn't appear to be a mirror site any longer. But maybe you can try looking on the JiG support page for a possible solution to get the game loading properly. the right way, on the first try, so I wasn't sure what elle meant there when I re-read. This one was relatively easy for Tesshi-e, I thought: after feeling a little stuck at the very beginning, I then got through it quickly with no need for a walkthrough. This is unusual for me.